SONOSIM SUMMARY: This case study from the Journal of Emergency Medicine describes how an emergency medicine physician used ocular ultrasonography to guide the diagnosis of new-onset optic neuritis in a 37-year-old diabetic male. The patient initially presented to the emergency department complaining of subacute, unilateral vision changes and pain. 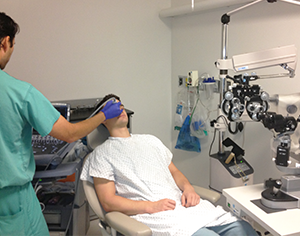 An ocular bedside ultrasound demonstrated optic nerve inflammation and optic disc cupping, and a subsequent MRI confirmed the diagnosis of optic neuritis. This case report exemplifies the potential utility of ocular point-of-care ultrasound and reinforces that optic neuritis should be considered in the differential diagnosis for young patients with vision complaints. Wayman D, Carmody KA. Optic Neuritis Diagnosed by Bedside Emergency Physician−Performed Ultrasound: A Case Report. Journal of Emergency Medicine. 2014 Mar 15; 47(3): 301-305. Optic neuritis is an inflammatory demyelinating condition of the optic nerve that causes subacute visual loss. It is often the result of an underlying systemic condition, such as multiple sclerosis. Due to the possible long-term morbidity associated with this condition, it is essential that the emergency physician recognizes the diagnosis and expedites treatment. This case report describes optic neuritis diagnosed at the bedside by emergency physician−performed ultrasound. This is a case report of a young man presenting with unilateral painful vision loss. Optic neuritis must be considered in the differential diagnosis of any young patient who presents with visual complaints without any other neurologic findings. This report is unique because there are very few cases describing the findings of optic neuritis on emergency physician−performed bedside ultrasound in the literature. This article presents the case, describes diagnostic modalities, especially the use of ultrasound in its diagnosis, and the course of treatment for this particular condition. To read the complete article, visit The Journal of Emergency Medicine by clicking here.